I am actually waiting to hear back if I can get an e-arc of this one! So excited to read Gail's YA series! I love her Parasol Protectorate series--which I still have to read the last book of--so I know this one will be equally awesome! This series sounds fun! Kind of like a historical Gallagher Girls. 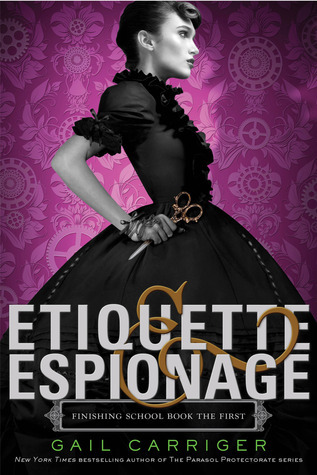 I haven't read the Parasol Protectorate series but I heard that one is great too! Everyone seem excited about this book. I cannot wait to see reviews and if it's really that good. Thanks for sharing. OO YES!! I have requested this on Edelweiss...not accepted as yet, but want to get my hands on this!!!! Interesting - hope it's worth the wait! I had this as a wow pick a couple of weeks ago, and I can't wait for it. It sounds really good! Great pick!! Thanks for stopping by my WoW! I've seen that one around, looks intriguing. Awesome pick! I also am super excited about this one. I feel like I have been waiting years for it to come out! Great pick, thanks for stopping by my WoW. I haven't read any of her books yet but, I have heard her adult series is great. I love this cover and I am really curious about this one. Great pick! Sounds exciting! Thanks for sharing...and enjoy! I've not read any steampunk so will have to check this out! I've seen this one around for a little while now, and I'm still excited every time I see the cover! I haven't read the Parasol series, but it is on my TBR list! Thanks for stopping by my WoW of The Beautiful and the Cursed by Page Morgan! This one sounds really good!Thanks for sharing! I really like this cover too! It has been on my TBR list for a while. I can't wait to read it! Oh this looks interesting! The cover is awesome. Thanks for stopping by my Wow. I'm super excited for this too! Also, Sophronia's name is really cool! OMGosh! I so can't wait to read this one, it looks so good!! Great pick! I am really excited about this one. i love the Parasol Protectorate series. great choice. I haven't heard of this one before so I will definitely be checking it out! That book looks really cool..love the cover! Sounds great! Reminds me of Grave Mercy without the nuns. I love all these assassin women. I love your pick this week! I saw this cover at BEA - they had it on another book though because Gail hadn't finished writing it yet but it's gorgeous! I haven't read anything by this author, but this book sounds interesting. Thanks for stopping by my blog. This is new for me but the blurb is fantastic and the cover is like WOW!! This book sounds so good and I love the cover! Thanks for stopping by my WoW. I can't wait to read this one - I still need to read her other series, but it sounds fabulous! First time I heard about this. But the cover looks nice! And intriguing. The description sounds interesting and i like the cover. Thanks for sharing, and for stopping by. I've seen this on somebody else's WoW and you just reminded me of it again. I can't until this finally comes out. Thanks so much for passing by my post!